When I was pregnant with Cora I was convinced that I would dress this baby girl of mine in the bright unisex style that Finn wears. I couldn't see why I would want fiddly dresses or those silly headbands and I saved all Finn's clothes for her to grow into. 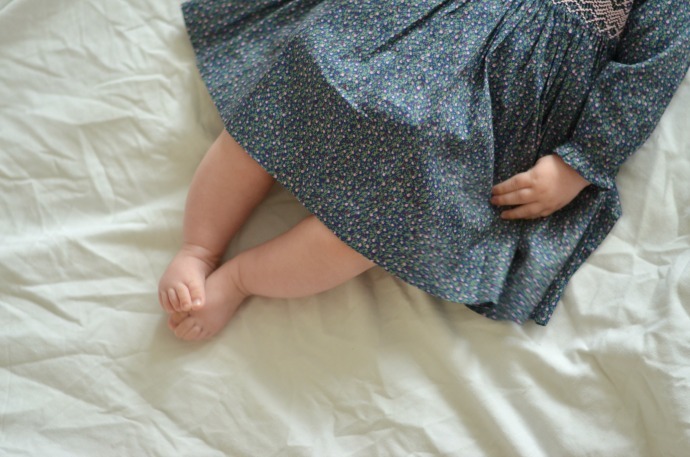 And she was a girl, undeniably a girl and the voice in the back of my head questioned whether some little dresses may not look quite cute, and how harmful a little bit of pink may be. And then suddenly her wardrobe started to look rather girly. 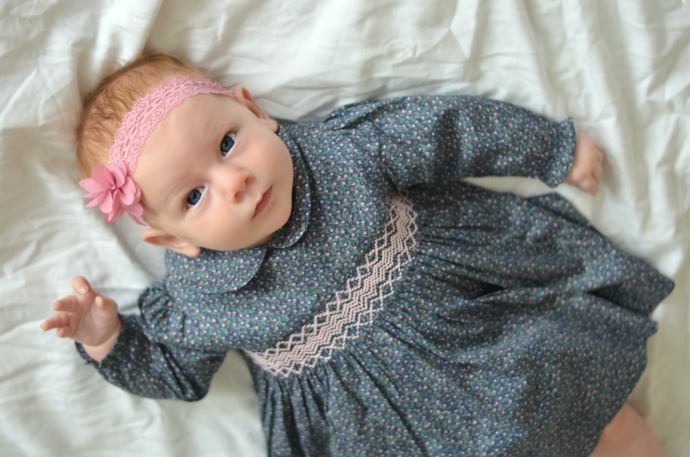 You still won't find her in a pink floral tutu, but Cora looks pretty adorable in her girly clothes! Question Everything makes beautiful traditional girl's dresses and their style is classic and classy. What is even better is that one of their dresses is called Cora - of course Cora had to have it! The Cora dress is a navy blue with a delicate flower pattern all over. I adore the style, Cora looks ever so girly and it reminds me so much of the dresses I used to wear as a little girl. It is a very different style to what I am used to, and the first item Cora has worn that isn't stretchy so I didn't find it as easy to put on (There are buttons all the way up the back of the dress). Once it was on though it looked comfy and it comes with a little matching nappy cover too. We popped some plain tights underneath as the weather is getting a little chillier! I love the little details, the collar, the smocking on the front, the heart shaped buttons up the back and the delicate little cuffs. It was a perfect little outfit to wear to a birthday party and I can only imagine it would look even cuter on a walking toddler! Cora is wearing the size 3-6 months here and she is an average sized 3 month old. There is plenty of growing space so I imagine it will last her a couple of months more. 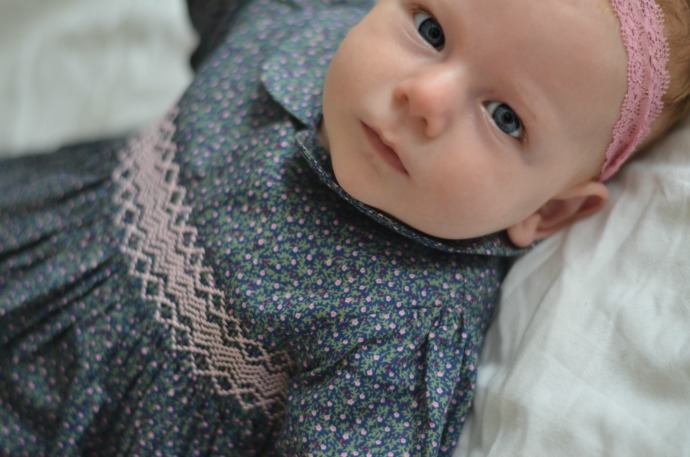 Thank you to Question Everything for sending Cora this beautiful Cora dress - despite the fact that she hates smiling at a camera, she does like it and I think it is just adorable! I remember at Bubble when you were pregnant and anything with frills or a lot of pink was a flat out no, hehe. I think sometimes it's fun to do the girly stuff and mix it up with a bit of bright too. She looks lovely in that dress, reminds me of the sort of 'special occasion' dresses I used to wear as a child.